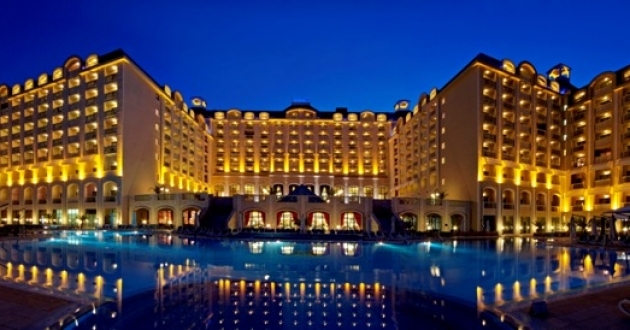 Location: Melia Grand Hermitage Hotel is located in the Golden Sands Resort in Bulgaria, near the city of Varna, directly at the Black Sea Coast. The hotel offers 5 star facilities, amenities and services for enjoyable summer vacation. It is surrounded by lush green terraces, leading down to the promenade and the beach. Accommodation: The hotel has 727 double rooms and suites, half of which are non-smoking. The room amenities consists of: balcony with table and chairs, air condition and heating, cable TV, minibar, safe, fax or/and PC plugs, LAN Internet access (free of charge), 2 direct dial telephones with speaker system, voice mail and self-programmable wake up call system, bathroom with hairdryer, separate shower booth with central rain shower and bathtub on side, telephone, emergency button, TV volume control. All rooms have sea or garden view. There are 5 rooms for physically impaired guests. In the hotel: 2 restaurants, 3 bars & bistros, 2 pool-bars, outdoor and indoor swimming pools with sweet water and children section, children playground with daily activities, fitness centre, sauna, doctor and dentist, spa centre with spa treatments, beauty salon, table tennis, billiards, chess, backgammon, currency exchange, shops, safe deposit boxes, laundry and dry cleaning, business centre, mail services, courier services, conference halls, car rental, taxi lot, underground garage, parking lots, room service, baggage storage, doctor. SPA facilities: the hotel dispose of a modern SPA-complex "YHI", offering therapies from Thailand and Indonesia, Hawaiian water massages, Japanese shiatsu massage, French procedures with curative mud and Turkish hammam - a classical eastern pleasure. Additional services: sauna with outdoor gardens, solarium, hydro massage, hydro jet, steam bath, face and body procedures, Beauty & Health Club with 18 treatment rooms. The special store in the SPA center offers Asian oils, aromas and exotic products for a perfect maintenance of your body. In "YHI" SPA you can just relax or fill with energy in the swimming pool. One of the best surprises is waiting for you in the Thracian room, where you can dip your body in a bath, full of red wine.